Much-loved: Sophie Gasparin died last October. JOHN Gasparin has an old pair of work boots that are hard to part with. His eldest daughter Sophie would use them to “slip outside to the animals”. Genevieve, 9, said her elder sister’s morning routine included “feeding the guinea pigs, dogs and cats” on their property in Stanthorpe, on the Granite Belt in Toowoomba diocese. Tiffany, 5, remembered her sister’s trail rides and in two shakes of a lamb’s tail returned to present precious photos of her pony “Hammy” (short for Abraham) and Sophie’s beloved horse “Mali”. 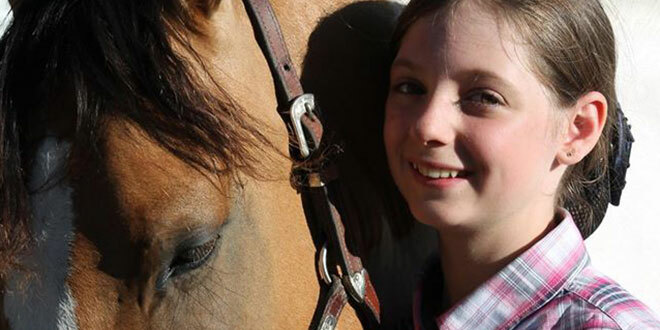 Mum Julie, a horse lover originally from Allora, filled in the trail-riding details and more, speaking of her 13-year-old daughter with such tangible tenderness saying “it doesn’t feel right not to talk about her” and “we want to honour her”. On October 5 last year, the day before the start of 2015’s final school term, Sophie was helping with farming chores as she had always done. Her earthly life ended in a farming accident that same day. Stanthorpe parish priest Fr Brian Connolly was called to the scene and his presence and prayers, Julie said, “meant so much”. The family and indeed, the parish community of which many generations of the Gasparins and their relatives are actively involved, gathered in prayer the same evening in their home church of St Joseph’s, where, in years gone by, Sophie had received each of the sacraments of initiation. A Requiem Mass was celebrated there by retired Fr Don Murray on October 19, with three priests concelebrating, including priest-in-residence Fr Lino Valente who’d baptised Sophie in September 2002. Sophie’s aunty Nita Gasparin spoke of a girl who “packed in a lot of living and learning in her 13 short years”. “Sophie had a passion for horses, gardening and handcrafts, especially crochet … (also) loving to ballet dance, read, draw and paint,” Mrs Gasparin said at the funeral. Mourners heard of Sophie’s passion for harvesting Jerusalem artichokes, brussel sprouts and garlic as “her father’s shadow” and alongside her grandfather “Nonno Terry” Gasparin. “She’d unload produce at the transport depot or anything else Terry was doing, even winemaking,” Mrs Gasparin said. Sophie’s afternoons were often spent with her grandmother “Nonna Mirella” Gasparin, and supervising her sisters and cousins. “Sophie would make sure everyone sat at the kitchen table with a plate … (and) the television and other devices were switched off,” Mrs Gasparin said at the funeral. Another “favourite” for Sophie was the annual Stanthorpe Show, recently held from January 29-31. From about age seven, the animal lover who dreamt of studying veterinary science helped her grandmother Carol Rix prepare and present the popular animal nursery, even “staying over at the show”, Julie said, to keep an eye on the animals and assist in any way. “There was a girl with a disability who helped at the nursery and Sophie would take care of her,” Julie said. The animal nursery at the Stanthorpe Show is now dedicated to Sophie’s memory in what Julie said was “emotional”. Many friends from St Joseph’s School, where Sophie completed primary education, and from Stanthorpe State High School, where she was enrolled in 2015, visited the animal nursery, sharing memories of a friendly and compassionate classmate. Before her death, Sophie learnt she was to receive two academic awards fuelled by her success across all subjects including in an Italian immersion program offered by the state high. “Sophie was very proud to receive those awards and the whole family was looking forward to it,” Julie said. John said Sophie planned to harvest and sell Jerusalem artichokes to fundraise for a trip to Italy with classmates this year. The Gasparins remain proud of the daughter who Julie said “left a mark on anyone she met” and who John said “gave anything a go, helping others do the same”. While “every day is hard, some days harder than others” they agreed it’s family support that helps them move forward, especially as John has six siblings and 16 first cousins, Sophie blessed by “special relationships with lots of aunties, uncles and cousins”. A sense of “we’ve got to keep going” also spurs their days. Julie said their reality had highlighted “the importance of making time for family” and it’s this message they wish to impress on others, in Sophie’s memory. Not unlike her mum, the unique and cherished daughter, granddaughter, great-granddaughter, sister, niece, cousin and friend appreciated life and creation. “Sophie found a bird’s nest in the bush,” Aunty Nita Gasparin said at her funeral. “She checked it every day until chicks had hatched and had flown away.